Fall clean up has started. We have a chipper, Troy Built 4326CS (under tarp) that we use to chip or shred the dead fall, weeds, garden refuse, and such. We can run it for about 2 hours on a tank of gas but usually we run out of steam a bit before that. Norm feeds the big sticks into the shredder and Elizabeth loads the leaves and light stuff into the shredder hopper. We get a lot of nice mulch. The pile was twice the size of the remaining pile. The contraption near the chipper is there to keep the chips from getting to spread out. Later, we'll rake/shovel/wheel barrow the chips onto grounds that need mulching. Speaking of mulch. We drove over to Jacknife Beach and got some sea grass for the garden beds. The sea grass decays into a rich nutrient that makes the next year's vegetables a little better. While at the beach, Elizabeth delighted in seeing two Willets. Two stone projects just completed. The driveway was re-stoned with 3/4 inch blue stone. this filled in some low spots that were puddling after rain and extended the parking area. It all started with four tons of stone. Over the course of two mornings, we spread the rock. Ther is no magic to it, shovel, wheel barrow and steel rake are all we used. The new stone settles slowly so the truck will make some ruts for a while and then things will settle down. In a couple of years, we'll do it again. They used to joke, in the old days, about "doing hard time, breaking rocks" as being a form of punishment. These days it is entertainment for retired people. Having some time free to do more rock work, we tackled a section of side yard path. The steps in the side yard path were not working out as planned. They didn't allow rain water to run off without undermining the flagstones. So, we ripped out one level entirely and reworked it adding new stones. Elizabeth made an adjustment to part of another section. A couple of other levels call for our attention... just not today. Rain is coming so we will see how well we did with the redesign. The section in the foreground is yet to be repaired, the filler is washing away. The two sections behind it are repaired... we hope. 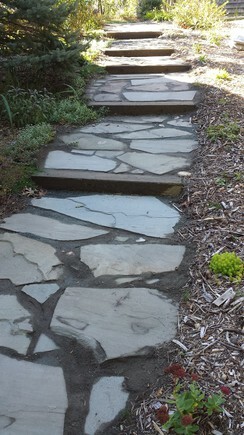 All this is made easier because we have a small pallet of flagstone in inventory. Cape cod is all sand which drains well. We have tried under layers of blue stone such as in the driveway. It doesn't seem to matter much. Directing the water flow has a bigger impact... we think. On a more lighthearted note, we had the grands and they got breakfast at the new kitchen table. The grands are pretty nice, too! Mama preparing a new batch of hot-hot pepper jelly at her new chestnut kitchen table. October 2015. Thanks Cape Cod Colonial Tables. There is a table making company in Chatham that takes old wood sourced in all sorts of places and fashions the wood into tables. A very specific business. The guys are terrific and made us a small table for the kitchen. When we bought the house the kitchen was a little smaller and had a boxy standard issue island in the space behind the sink, where this table is located. We removed the island and started looking for something a bit less boxy. This is the result. Cape Cod Colonial Tables let us bring the top home and set it up in the space to see if it really fit the way we envisioned it. the top was the right size but the height was wrong. With a little shimming and wedging, we got a height that was perfect for Elizabeth. The guys made a set of legs that height and here we are. One consideration is that the two stools we have near the L can fit under the table, allowing grand kids to "work" in the kitchen with grandma. It took us a few days to sand and varnish the wood. We use Minwax's Helmsman Clear Satin.